Every woman dreams about beautiful and perfect body. We all sit on diets, go to the gym and fitness. We perform a very hard work to achieve a perfect body. But there is one thing that is very difficult to bring into shape. This thing is our arms. Are you agree? If you still searching of effective exercises for your arms, now you can relax! 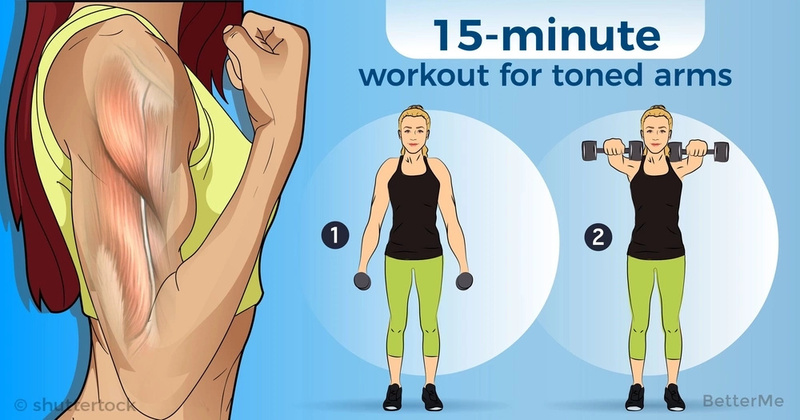 Because we have a 15-minutes workout for your toned arms. This is Pilates workout. Pilates is all about incorporating exercises to make everyday life easier and more pain-free. This incredible routine will help you strengthen and sculpt every single inch of your biceps, triceps, shoulders and back. To perform these exercises there is no need to go to the gym because you can perform them at home. You need a pair of light weights to perform our workout exercises. You should perform each exercise for at least 10 repetition. Do not forget to drink enough water during performing exercises and after finishing this workout to keep your body hydrated. Wear a sports uniform and turn out dance music to make your routine energetic! You should give your bombshell body the gift of beautiful and toned arms. Let’s do it!